We, at Bit World, pride ourselves in carrying the largest stock of bits in the United Kingdom, with well over 1,000 bits of all shapes and sizes available for immediate sale. We do not only carry popular sizes, nor do we try to push our 'own brand' to the exclusion of a more informed choice. You are most welcome to visit our shop, and to see the vast range on offer, and to discuss with our staff, the solution to your problems. You are even welcome to count all the bits we display to confirm that this is not just a boast, but a fact, that is, of course, if you have an afternoon to spare! 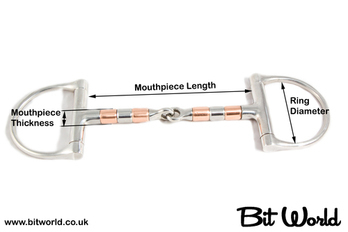 Bitting is an exact science, gained by years of experience; we have found that, very often, your problem has cropped up many times before with other riders, but please, remember, so very often the fault lies with the rider's hands, and not with the horse's mouth. We like to think our vast experience, gained over many years, can be used to diagnose your requirements, We are also aware that, like many things today, some bits suddenly become fashionable. 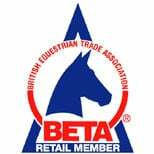 Possibly, because one of our stars has been seen on television competing with a certain bit in their horse's mouth, that it will answer your prayer for an 'arm chair' ride, we will always try to give you an honest opinion, even if this means that we miss a sale, we value you as a customer, and hope that you will come back to us in the future, should the need arise. Bit World also offers a hire and trial service. For more details on this please ring on 01664 812298. Custom made bits can be made to order and this can take around two to three weeks to be made up. How do I Measure My Current Bit? One of the many questions we are asked is "how do I measure my current bit?" The diagram to your left shows how measurements are taken. The majority of bits are still measured in inches. Though metric is slowly starting to creep in. Custom made bits can be made in various sizes and thickness. We are often asked about 61/2" and 7" bits and they are readily available in the following styles. Dressage Legal - Loose ring and eggbutt French link, and a French link Hanging cheek. Non dressage legal - Waterford loose ring. Pelhams - Waterford, Swales, Hard rubber mullen, Loose ring pelham and a Cambridge (ported) Rugby. Gags - Jointed and French link 4 ring gag, Cheltenham gag and a Sweet iron Tom Thumb. Liverpools - ported and straight bar. Please contact us as we often have these here in the shop.